1. Collect only first or second milking colostrum into a clean and dry container (plastic shipping/measuring container will suffice). Make sure the udder is clean and that no foreign debris is allowed into the measuring cylinder. Remember: The precolostral calf is highly susceptible to disease, so every effort needs to be extended to insure the calf is not exposed to unnecessary bacteria or foreign contamination during feeding. 2. Transfer approximately 750 ml (or about 3/4 quart) of standard room temperature (70°F/21°C) colostrum into the included plastic shipping container/measuring cylinder. Important: Make sure that the colostrum is as close to standard room temperature as possible prior to reading. Small deviations in temperature will not result in appreciable quality measurement differences; however, if the colostrum is either at harvest temperature or refrigerator temperature, then the colostrum should be cooled or warmed, respectively, to a temperature closer to standard room temperature. 3. Make sure the colostrum is to the top of the measuring cylinder, and then remove all remaining foam and scum from the surface. Tip: Overflowing the measuring cylinder with colostrum will insure that most of the foam and scum will automatically be removed. Tip: Any size container may be used as long as the instrument is not surrounded by any foam or scum can float freely, and the scale accurately read. 4. Gently lower the COLOSTROMETER™ into the measuring cylinder (or any suitable container) filled with colostrum, allowing excess colostrum to overflow the cylinder, until the instrument floats freely. Tip: Since colostrum is extremely sticky, try and avoid allowing the instrument to dip lower than necessary, and thus, wetting the unsubmerged portion. By over-wetting the unsubmerged portion will produce slight differences in quality readings. 5. 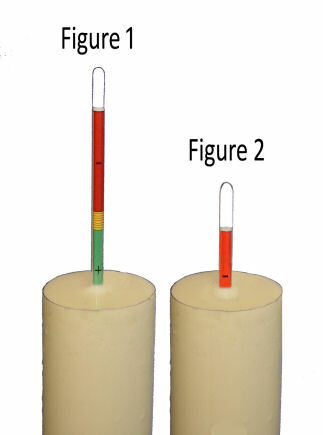 With the instrument floating freely in the measuring cylinder full of colostrum, determine the quality of the colostrum by reading the color coded scale immediately above the unsubmerged portion of the instrument. Tip: If the unsubmerged portion of the instrument becomes wetted, then carefully raise the instrument several inches up (avoid removing the instrument completely) and wipe with a clean tissue or cloth; then carefully re-lower into the colostrum trying to avoid having too much colostrum accumulate on the neck of the instrument. Green Results - FEED. If the colostrum registers in the green zone, then it is of sufficient quality to feed to newborn precolostral calves. See Figure 1. Yellow Results - DO NOT FEED... If the colostrum measures in the yellow zone, then it may be used to feed postcolostral one- or two-day old calves. Red Results – DO NOT FEED. If the colostrum reads in the red zone, then it should only be used to feed postcolostral two-day and older calves. See Figure 2. Temperature Rule of Thumb 1: If the colostrum is fresh from the dam, and registers at the border between yellow and green, then that colostrum, if cooled to standard room temperature will always register well into the green zone. Go Ahead and Feed! Temperature Rule of Thumb 2: If the colostrum is fresh from the refrigerator, and registers on the border of yellow and green, then that colostrum, upon warming to standard room temperature will always register well into the yellow or red zone. Do Not Feed To Newborn Precolostral Calves! 6. Immediately rinse instrument in cold water to remove scum, and then wash with soap and warm water prior to storage in measuring cylinder. Tip: Any excess scum will cause the instrument to weigh more, and thus, float deeper in the colostrum and may result in false negative readings.